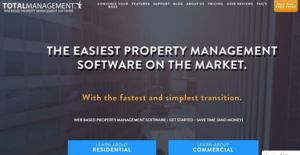 Total Management is a cloud-based property management software for medium-sized and large business managing commercial, residential and students housing properties. It is a cost-effective solution that provides tools for emailing work order, complete accounting capabilities, and connecting with tenants & residents to proficiently manage and grow business. The platform offers a property management solution that integrates customizable Common Area Maintenance (CAM) with highly effective tenant tracking and leasing to automate and streamline the tasks for property owners and managers. It allows users to go paperless to cut expenses and serve residents and tenants more efficiently with the ability to access information anytime, anywhere. Some of its main features include tenant screening, comprehensive accounting, rent tracking, training & onboarding, work orders, online marketing, tax reconciliation, Common Area Maintenance (CAM), and tenant portal. Total Management consolidates the entire operation of property management into a functional system with unlimited capabilities. It’s an all-inclusive software that delivers robust features designed to expedite the whole cycle of managing residential and commercial properties. The platform provides a clean and intuitive interface that enables you to perform multiple tasks by navigating different screens without using tabs. It allows you to multitask on different windows simultaneously and save work on one window without losing unsaved work in the other windows. The comprehensive accounting system empowers you to accurately manage CAM & tax reconciliation, security deposits, tenant work order, and not sufficient funds (NSF) checks. It provides a late rent module that helps you track who has paid and who has not over a stipulated period of time. This module lets you generate a balance aging report while offering unfettered access to a suite of messages for late notices, invoices, and evictions. Total Management is designed to support simplified moving. It handles all the paperwork required when moving out to streamline the operation even if the tenant is just changing units. The software automatically computes the amount owed to the tenants or vice versa before generating checks to be forwarded to the new address of the moving tenant. Better still, the tenant portal delivers a better online service and allows tenants to make payments using electronic funds or credits cards. The tenants can easily set up automatic payments or payment reminders and request work orders via the online portal. In addition, you can update all tenants by sending online newsletters to inform them of everything regarding your property. If you are interested in Total Management it might also be a good idea to investigate other subcategories of Best Property Management Software collected in our database of B2B software reviews. It's important to note that almost no app in the Property Management Software category is an ideal solution able to fulfill all the needs of all business types, sizes and industries. It may be a good idea to read a few Total Management reviews first as specific software might excel only in a very narrow group of applications or be created with a really specific industry in mind. Others might operate with an intention of being simple and intuitive and therefore lack advanced functionalities welcomed by more experienced users. You can also find solutions that cater to a wide group of users and provide a powerful feature base, but that in most cases comes at a more expensive cost of such a service. Ensure you're aware of your requirements so that you pick a solution that offers all the features you look for. How Much Does Total Management Cost? We realize that when you make a decision to buy Property Management Software it’s important not only to see how experts evaluate it in their reviews, but also to find out if the real people and companies that buy it are actually satisfied with the product. That’s why we’ve created our behavior-based Customer Satisfaction Algorithm™ that gathers customer reviews, comments and Total Management reviews across a wide range of social media sites. The data is then presented in an easy to digest form showing how many people had positive and negative experience with Total Management. With that information at hand you should be equipped to make an informed buying decision that you won’t regret. What are Total Management pricing details? What integrations are available for Total Management? If you need more information about Total Management or you simply have a question let us know what you need and we’ll forward your request directly to the vendor.